For my maiden “Cellar Favourite”, the obvious choices would be either Bordeaux or Burgundy because I am fortunate to drink a hell of a lot of old and rare bottles. But instead, I opted for a Northern Rhône that I drank before Christmas with friends at one of my favorite London restaurants, Chez Bruce. It was a BYO with serious bottles flying around to bid farewell returning to warming climes for the winter. 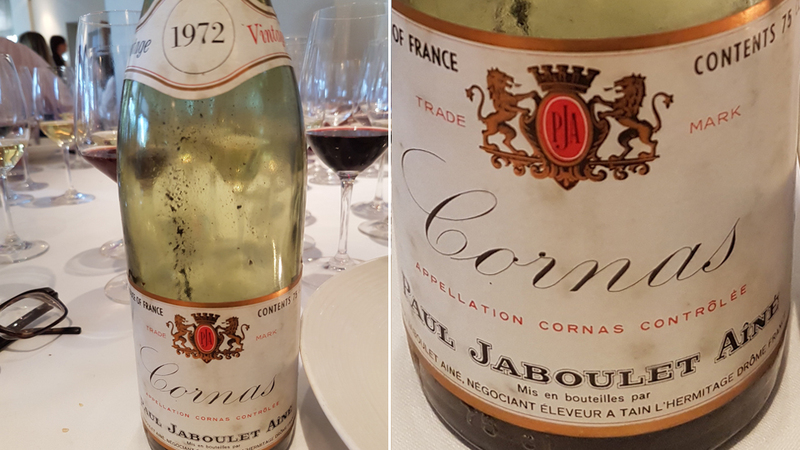 I took a chance with the 1972 Cornas from Paul Jaboulet Ainé, partly because I had never encountered such a venerable Cornas. I was curious. The reputation of this vintage is tarnished because Bordeaux, and to a much lesser extent Burgundy, suffered a poor growing season. This was not the case in the Northern Rhône. The few bottles I have encountered (including Hermitage “La Chapelle”) have been sublime. Hardly any growers bottled their own wine during this era, to the extent that this bottle represented practically the entirety of Cornas. Every grower, maybe with the exception of Marcel Juge, would have contracted his or her fruit to Paul Jaboulet Ainé, who did not acquire their “St-Pierre” vineyard until 1993.